Review posted April 16, 2016. Feiwel and Friends, New York, 2015. 827 pages. Ah! The Lunar Chronicles come to a satisfying end in this book. If you have read this far, I don’t have to say anything to get you to read the final volume, so let me make some comments about the series in general. What I loved most was the fairy tale parallels. 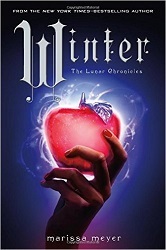 Cinder paralleled “Cinderella,” Scarlet paralleled “Little Red Riding Hood,” Cress paralleled “Rapunzel,” and this final book, Winter, parallels “Snow White.” However, all the characters from each of the previous books are still in the story – and by the final book, elements from Snow White’s story seemed forced. (Whereas in Cinder they arrived in natural and clever ways.) In particular, the part about the poisoned apple seemed totally unnecessary in the overall scheme, and I didn’t really believe that a disease would progress the way this one was portrayed. But I do like the character of Winter, and even her status as Queen Levana’s stepdaughter worked well. I do like that each of the main characters is very different from the others. I still didn’t really believe in the wolf-human hybrids, which has been a problem for me since Scarlet. I didn’t particularly like the additional information we got about that in this book – didn’t make it easier to believe. At first when I opened this book, I thought, okay, we’ve got four couples. Two have matched up with the one they love but have some obstacles between them. Two are in love but haven’t admitted it to each other yet. And I knew all four would get together by the end of the book, and I thought that was a bit much. But I have to hand it to Marissa Meyers – she kept each romance distinct and interesting. All four plotlines are definitely not simple! In fact, if anything the plot was a bit too convoluted with all those characters to juggle. But that did keep things from being at all boring or predictable and kept you turning pages. She is one of those authors who gives you a lot of interior monologue – which means it takes a little longer for actions to happen. This book is more than 800 pages long, since that’s what it took to tie everything together. In some spots, we were following three different sets of characters in different places, so that slowed things down, too. However, all that said – in this book pulling all the threads together, Marissa Meyer accomplishes a well-earned Happily Ever After. Though I was able to put down the book and go to sleep, I was never even slightly tempted to set it aside altogether, and I began reading the same day my hold arrived. We’ve got life and death situations and the fate of earth at stake. We’ve got an intrepid band of rebels who go deep into the tyrant’s territory. Can they win the day?